In January, senior Zeena Lattouf visited Zaatari, one of the biggest Syrian refugee camps in Jordan. Her documentary about the lack of education in the camp, produced with fellow student Meredith Stedman, screens Monday on campus. View a trailer for "Zaatari"
In the midst of wrapping up her final semester at Emory, senior Zeena Lattouf has one more thing she'd like to share with the University community: a documentary she has produced with film editor and fellow Emory senior Meredith Stedman on the education crisis among young Syrian refugees in Zaatari, a Syrian refugee camp in Jordan. "Zaatari," a documentary about refugee education, will be screened at 6 p.m. Monday, May 2, in Harland Cinema at the Dobbs University Center. Free tickets are available online. 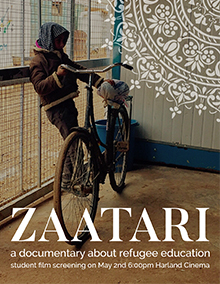 The brief documentary is based on Lattouf's trip to Zaatari in January. The goal of the film, says Lattouf, "is to shed light on the lack of education received by these children" and to convey a sense of urgency about the problem. "If refugees are educated, then they will have economic stability and a sense of self-worth, which will in turn allow them to give back to their community, their country, and the host country they are in," Lattouf says. Zaatari, one of the biggest Syrian camps in Jordan, is located near the city of Mafraq and currently houses about 80,000 refugees, all of whom are Muslim and most of whom are women and children. The camp opened in 2012 to host Syrians fleeing the violence of the ongoing civil war and is evolving into a permanent settlement. 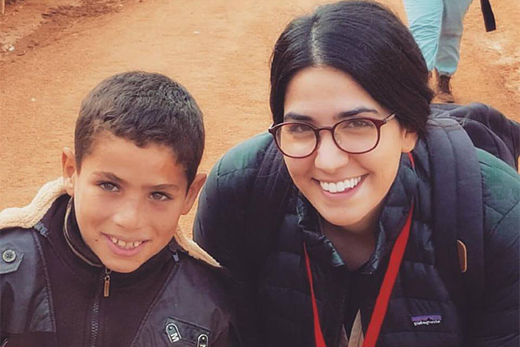 Lattouf, a Middle East and South Asian Studies (MESAS) major, received the department's Amy Johnson Study Abroad Award, which supported her trip. Lattouf was raised in Atlanta, but her family is originally from Jordan and still has a house in the capital city of Amman, about an hour's drive from Zaatari. Since it is very difficult for students to get entry into the camp, Lattouf traveled with her father, Omar Lattouf, a professor of cardiothoracic surgery at Emory's School of Medicine, and sister, Emma Lattouf, a dentist. Their trip was under the auspices of the Syrian American Medical Society, one of the organizations working with the United Nations High Commissioner for Refugees to provide services to residents of the camps. spur meaningful financial support for more resources. Although her plans after graduation are still evolving, her commitment to refugee education is central to her future. "I would love to do research to prove that if refugee children have teachers who care, their psychological and academic development will be tremendous," she says.